When Julia Gorton was a downtown girl, part of the no-wave scene, she didn’t know much about photography or the streets above 14th Street, but the area below was her home, and taking photos was her passion. For a brief moment in the late 1970s, Julia was one of many who came together to listen to music, form bands, make art, create fashion, publish fanzines, and take photos. No wave had a DIY spirit, with nihilism, dark humor, beat literature, and the avant-garde as part of its extensive and varied influences. Although the city was in a severe economic decline then, Julia found it—and her subjects—intriguing and glamorous. These images are being shown in New York City for the first time in four decades. 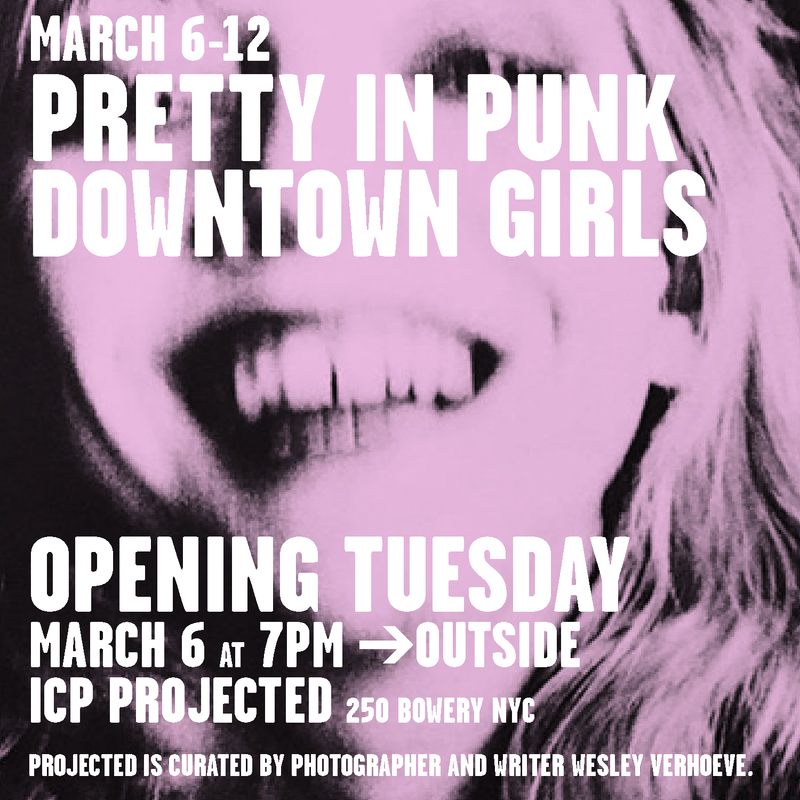 During the day, Pretty in Punk: Downtown Girls can be viewed on monitors inside the ICP Museum and during evening hours, images are literally “projected” onto the windows of the ICP Museum; they can be viewed from the sidewalk outside the Museum and are most visible after sunset. Julia Gorton (b. 1958, Wilmington, Delaware) started her career as a photographer, designer, and visual director of the No Wave fanzine Beat It!, which offered commentary and information about the New York City music scene from 1977 to 1980. Her high-contrast photos combined with graphic patterns, DIY lettering, and random collaged elements captured a fleeting time with unique style. Gorton’s photos of musicians, including Patti Smith, Debbie Harry, Tom Verlaine, David Byrne, Lydia Lunch, Iggy Pop, and Richard Hell, were prominently featured in No Wave: Post-Punk, Underground, New York, 1976-1980 by Thurston Moore and Byron Coley, and included in Who Shot Rockand Roll: A Photographic History, 1955–Present by Gail Buckland and Untypical Girls by Sam Knee. Recently, her work has gained a following on Instagram and has been covered by Garage, Vice, I-D, Another Man, Obey, and the McQ Fanzine. Julia will be a panelist at South by Southwest 2018 in Austin.